I just saw a video of a Google self-driving bike on Linked-In. It is a 2017 April Fool prank, but that just means it is fake in this instance, it doesn’t mean it couldn’t be done in real life. It is fun to watch anyway. In 2005 I invented a solution for pulling bikes along on linear induction motor bile lanes, pulling a metal plate attached (via a hinged rod to prevent accidents) to the front forks. The original idea was simply that the bike would be pulled along, but it would still need a rider to balance it. However, with a fairly small modification, it could self balance. All it needs is to use plates on both sides, so that the magnetic force can be varied to pull one side more than the other. If the force is instantly variable, that could be used in a simple control system both to keep the bike vertical when going straight and to steer it round bends as required, as illustrated on the right of the diagram. 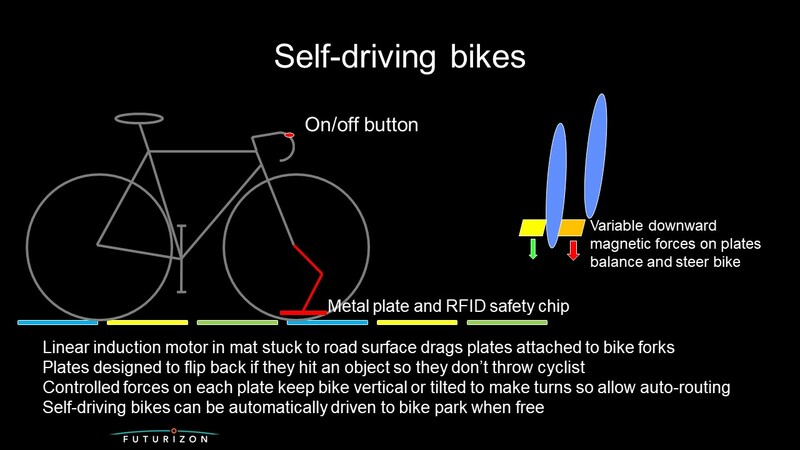 Therefore the bike could be self-driving. Self-driving bikes would be good for lazy riders who don’t even want the effort of steering, but their auto-routing capability would also help any rider who simply wants navigation service, and presumably some riders with disabilities that make balancing difficult, and of course the propulsion is potentially welcome for any cyclist who doesn’t want to arrive sweaty or who is tiring of a long hill. Best of all, the bikes could find their own way to a bike park when not needed, balancing the numbers of available bikes according to local demand at any time. The Space Anchor would also allow space dogfights like you see in Star Wars. Unless you’re a pedant like me, you probably never think about how space fighters turn in the vacuum of space when you’re watching movies, but wings obviously won’t work well with no atmosphere, and you’d need a lot of fuel to eject out the back at high thrust to turn otherwise, but the space anchor actually locks on to a point in space-time and you can pivot around it to reverse direction without using fuel, thanks to conservation of angular momentum. Otherwise, the anchor drifts with ‘local’ space time expansion and contraction, which essentially creates relativity based ‘currents’ that can pull a spacecraft along at high speed. But enough about Space Anchors. Read my novel Space Anchor to see how much fun they could be. but I’d personally put these ‘Em-drives’ in the basket with cold fusion and perpetual motion machines. Sure, there have been experiments that supposedly show they work, but so do many experiments for cold fusion and perpetual motion machines, and we know those results are just experimental or interpretational errors. Of the existing techniques that don’t contradict known physics or rely on unverified and debatable hypotheses, the light sails are best and get 10% of light speed at high expense. A few proposed thruster-based systems use particles collected from the not-quite-empty space as the fuel source and propellant. Again, if we stretch the Casimir effect theory to near breaking point, it may be possible to use virtual particles popping in and out of existence as propellant by allowing them to appear and thrusting them before they vanish, the quantum thruster drive. My own variant of this solution is to use Casimir combs with oscillating interleaving nano-teeth that separate virtual particles before they can annihilate to prolong that time enough to make it feasible. I frankly have no idea whether this would actually work. You can explore other theoretical interstellar drives via Google or Wikipedia, but you won’t find my latest idea there – the Quantum Ratchet Drive. I graduated in Theoretical Physics, but this drive is more in the Hypothetical Physics Department, along with my explanations for inflation, dark matter and novel states of matter. That doesn’t mean it is wrong or won’t work though, just that I can’t prove it will work yet. Anyway, faint heart ne’er won fair maid. 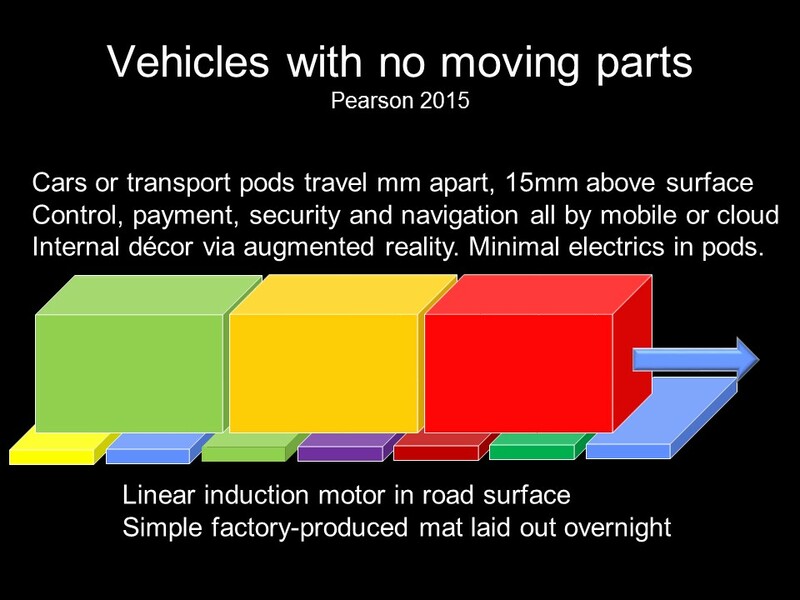 You have seen pics of trains that climb steep slopes using a rack and pinion system, effectively gear wheels on a toothed rail so that they don’t slip (not the ones that use a cable). I originally called my idea the quantum rack and pinion drive because it works in a similar way, but actually, the more I think about it, the more appropriate is the analogy with a ratchet, using a gear tooth as a sort of anchor to pull against to get the next little bit of progress. It relies on the fact that fields are quantized and any system will exist in one state and then move up or down to the next quantum state, it can’t stay in between. At this point I feel I need another 50 IQ points to grasp a very slippery idea, so be patient – this is an idea in early stages of development. I’m basically trying to harness the physics that causes particles to switch quantum states, looking at the process in which quantum states change, nature’s ‘snap to grid’ approach, to make a propulsion system out of it. If we generate an external field that interacts with the field in a nearby microscopic region of space in front of our craft then as the total field approaches a particular quantum threshold, nature will drag that region to the closest quantum state, hopefully creating a tiny force that drags the system to that state. In essence, the local quantum structure becomes a grid onto which the craft can lock. At very tiny scales obviously, but if you add enough tiny distances you eventually get big ones. But space doesn’t have a fixed grid does it? If we just generate any old field any which way in front of our craft, no progress will happen because nature will be quite happy to have those states in any location in space so no force of movement will be generated. HOWEVER… suppose space did have such a grid, and we could use interaction of the quantum states in the grid cells and our generated field. Then we could get what we want, a toothed rail with which our gearwheels can engage. So we just need a system that assigns local quantum states to microscopic space regions and that is our rack, then we apply a field to our pinion that is not quite enough to become that state, but is closer than any other one. At some point, there will be a small thrust towards the next state so that it can reach a local minimum energy level. Those tiny thrusts would add up. We could use any kind of field that our future tech can generate. Our craft would have two field emitters. One produces a nice tidy waveform that maps quantum states onto the space just in front of our craft. A second emitter produces a second field that creates an interaction so that the system wants to come to rest in a region set slightly ahead of the craft’s current position. It would be like a train laying a toothed track just in front of it as it goes along, always positioning the teeth so that the train will fall into the next location. We could certainly produce EM fields, making a sort of stepper linear induction motor on a mat created by the ship itself. What about strong or weak nuclear forces? Even if stuck with EM, maybe we use rotating nuclei or rotating atoms or molecules, which would move like a microscopic stepper motors across our pre-quantized space grid. Tiny forces acting on individual protons or electrons adding up to macroscopic forces on our spacecraft. If we’re doing it with individual atoms or nuclear particles, the regions of space we impose the fields on would be just ahead of them, not out in front of the spacecraft. If we’re using interacting EM fields, then we’re relying on appropriate phasing and beam intensities to do the job. As I said, early days. Needs work. Also needs a bigger brain. Intuitively this ought to work. It ought to be capable of up to light speed. The big question is where the energy comes from. It isn’t an impulse drive and doesn’t chuck matter out of a rocket nozzle, but it might collect small particles along the way to convert into energy. Or perhaps nature contributes the energy. 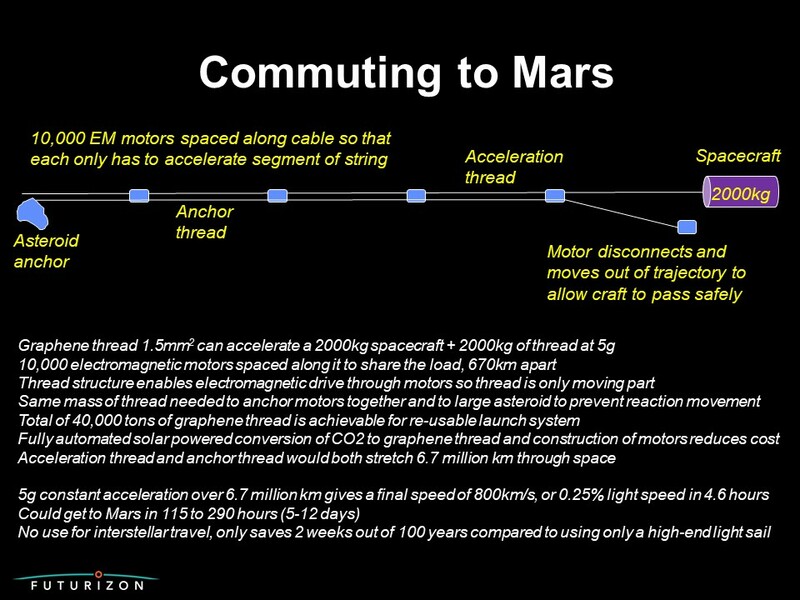 If so, then this could get light speed travel without fuel and limited on-board energy supply. Just like gravity pulls a train down a hill, perhaps clever phase design could arrange the grid ahead to be always ‘downhill’ in which case this might turn out to be yet another vacuum energy drive. I honestly don’t know. I’m out of my depth, but intuition suggests this shows promise for someone smarter. In 1863, Jules Verne wrote about the idea of suspended transatlantic tunnels through which trains could be sent using air pressure. Pneumatic tube delivery was a fashionable idea then, and small scale pneumatic delivery systems were commonplace until the late 20th century – I remember a few shops using them to transport change around. In 1935, the film ‘The tunnel’ featured another high speed transatlantic tunnel, as did another film in 1972, ‘Tunnel through the deeps’. Futurists have often discussed high speed mass transit systems, often featuring maglev and vacuums (no, Elon Musk didn’t invent the idea, his Hyperloop is justifiably famous for resurfacing and developing this very old idea and is likely to see its final implementation). Anyway, I have read quite a bit about supercavitation over the last years. First developed in 1960 as a military idea to send torpedoes at high speed, it was successfully implemented in 1972 and has since developed somewhat. Cavitation happens when a surface, such as a propeller blade, moves through water so fast that a cavity is left until the water has a chance to close back in. As it does, the resultant shock wave can damage the propeller surface and cause wear. In supercavitation, the cavity is deliberate, and the system designed so that the cavity encloses the entire projectile. In 2005, the first proposal for people transport emerged, DARPA’s Underwater Express Program, designed to transport small groups of Navy personnel at speeds of up to 100 knots. Around that time, a German supercavitating torpedo was reaching 250mph speeds. More promising articles suggest that supersonic speeds are achievable under water, with less friction than going via air. Achieving the initial high speed and maintaining currently requires sophisticated propulsion mechanisms, but not for much longer. 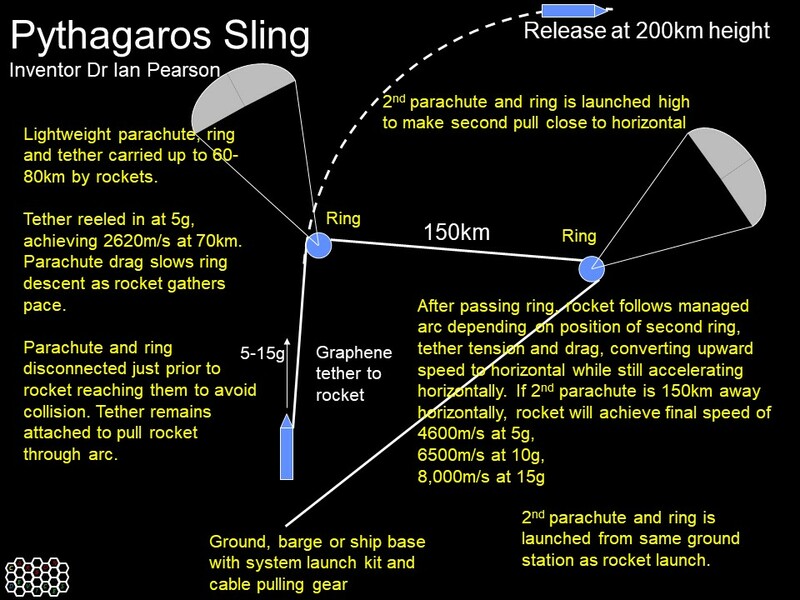 I believe the propulsion problem can be engineered away by pulling capsules with a strong tether. That would be utterly useless for a torpedo of course, but for a transport system would be absolutely fine. Transatlantic traffic is quite high, and if a cheaper and more environmentally friendly system than air travel were available, it would undoubtedly increase. My idea is to use a long string of capsules attached to a long graphene cable, pulled in a continuous loop at very high speed. Capsules would be filled at stations, accelerated to speed and attached to the cable for their transaltlantic journey, then detached, decelerated and their passengers or freight unloaded. Graphene cable would be 200 times stronger than steel so making such a cable is feasible. The big benefit of such a system is that no evacuated tube is needed. The cable and capsules would travel through the water directly. Avoiding the need for an expensive and complex tube containing a vacuum, electromagnetic propulsion system and power supply would greatly reduce cost. All of the pulling force for a cable based system would be applied at the ends. Graphene cable doesn’t yet exist, but it will one day. I doubt if current supercavitation research is up to the job either, but that’s quite normal for any novel engineering project. Engineers face new problems and solve them every day. 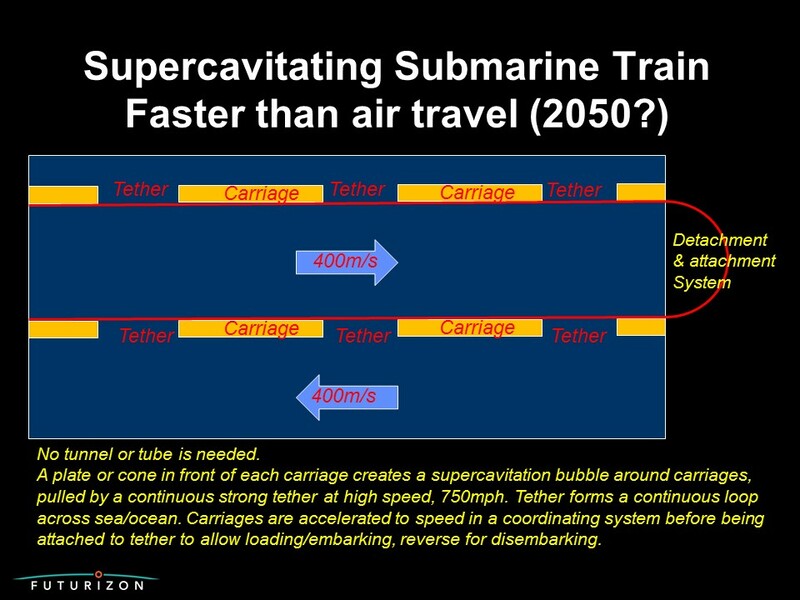 By the time the cable is feasible, we will doubtless be more knowledgeable about supercavitation too. So while it’s a bit early to say it will definitely become reality, it is certainly not too early to start thinking about it. Some future Musk might well be able to pull it off. 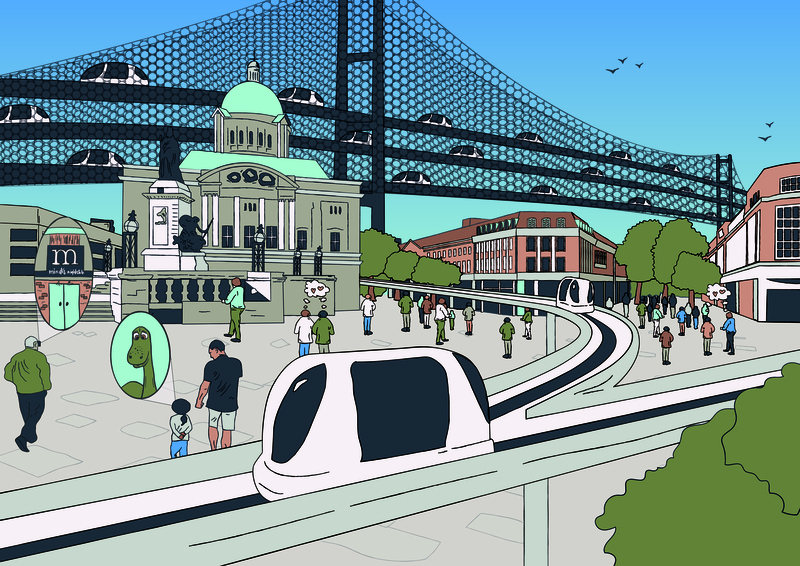 I wrote a piece for KCOM on what we can expect to feature in the city by 2050. A zero carbon air travel solution. Well, most of the bits would be made of carbon materials, but it wouldn’t emit any CO2. The pic says it all. 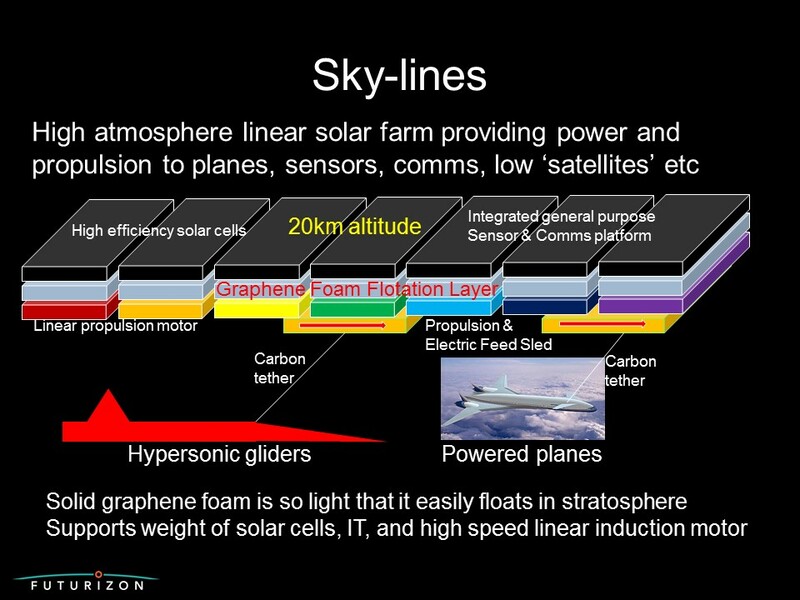 A linear solar farm suspended in the high atmosphere to provide an IT platform for sensors, comms and other functions often accomplished by low orbit satellite. 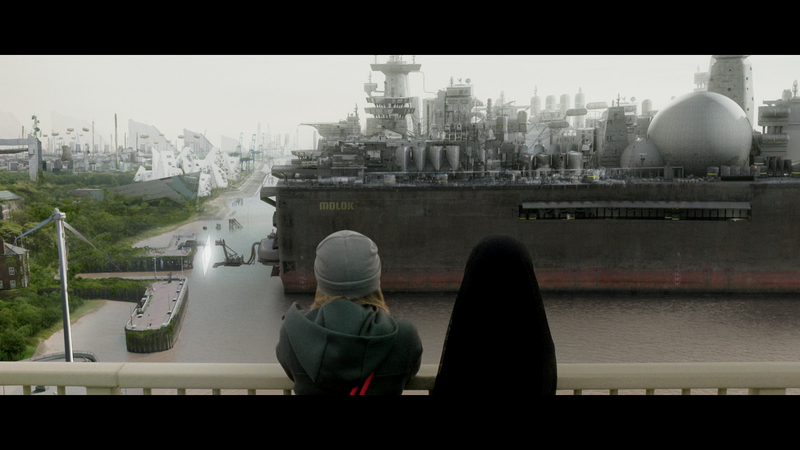 It would float up there thanks to being fixed to a graphene foam base layer that can be made lighter than helium (my previous invention, see https://timeguide.wordpress.com/2013/01/05/could-graphene-foam-be-a-future-helium-substitute/ which has since been prototyped and proven to be extremely resilient to high pressures too). Ideally, it would go all the way around the world, in various inclinations at different altitudes to provide routes to many places. Carbon materials are also incredibly strong so the line can be made as strong as can reasonably be required. The flotation layer also supports a hypersonic linear induction motor that could provide direct propulsion to a hypersonic glider or to electric fans on a powered plane. Obviously this could also provide a means of making extremely low earth orbit satellites that continuously circumnavigate the ring. I know you’re asking already how the planes get up there. There are a few solutions. Tethers could come all the way to ground level to airports, and electric engines would be used to get to height where the plane would pick up a sled-link. Alternatively, stronger links to the ground would allow planes to be pulled up by sleds, though this would likely be less feasible. Power levels? Well, the engines on a Boeing 777 generate about 8.25MW. A high altitude solar cell, above clouds could generate 300W per square metre. So a 777 equivalent plane needs 55km of panels if the line is just one metre wide. That means planes need to be at least that distance apart, but since that equates to around a minute, that is no barrier at all. If you still doubt this, the Hyperloop was just a crazy idea a century ago too.